SAN JUAN — The U.S. Justice Department is attempting to replace the top federal prosecutor in Puerto Rico, who has been quietly campaigning to keep her job, according to people familiar with the matter. The Justice Department is close to proposing a candidate to succeed Rosa Emilia Rodríguez-Vélez, the U.S. attorney for the district of Puerto Rico, people familiar with the matter said. Ending her nearly 12-year tenure in office would require the U.S. Senate to confirm a replacement, a process that could take weeks or months, some of the people said. The White House also supports replacing Rodríguez-Vélez, a person familiar with the matter said. U.S. attorneys, while somewhat autonomous, do take direction from Justice Department headquarters on prosecutorial priorities. A White House spokesman didn’t respond to a request for comment. Efforts to replace Rodríguez-Vélez coincide with rising concerns from the Federal Bureau of Investigation’s San Juan field office and other federal authorities about potential fraud and corruption in Puerto Rico’s public contracting, according to people familiar with the matter. The FBI views public corruption as a potentially growing problem in Puerto Rico, fueled by billions of dollars in disaster-recovery spending following last year’s devastating hurricane season, these people said. The U.S. attorney’s office in Puerto Rico also frequently prosecutes drug trafficking and violent crime. A spokeswoman for Rodríguez-Vélez said “we work very closely with the FBI and respect and cherish our ongoing partnership” and that there were no disagreements with her office about pending investigations. The special agent in charge of the FBI’s San Juan division, Douglas Leff, declined to comment through a spokesman. The Justice Department didn’t respond to a request for comment. There were 364 federal public corruption convictions in Puerto Rico from 2007 to 2016, the fourth-most among the U.S. federal judicial districts in that time period, according to the Justice Department’s Public Integrity Section. An additional influx of federal grant money over the next several years is earmarked for repairing housing and other infrastructure destroyed by Hurricane Irma and Hurricane Maria. The Department of Housing and Urban Development last month awarded a $18.5 billion community development block grant for Puerto Rico, the largest single disaster recovery award in the agency’s history. The FBI also opened a probe into a $300 million power grid construction contract awarded shortly after Hurricane Maria. A congressional committee with jurisdiction over the U.S. territories is investigating anticorruption safeguards at the public electric monopoly, the Puerto Rico Electric Power Authority (PREPA) and alleged hoarding of utility supplies. Meanwhile, the federal board supervising Puerto Rico’s finances is preparing to seek disclosures from the law firms and financial advisers hired to navigate the largest-ever municipal bankruptcy. Those information requests, which haven’t been publicly released, would aim to sniff out potential pay-to-play deals or conflicts of interest among Puerto Rico’s professional advisers, according to people familiar with the matter. Rodríguez-Vélez’s tenure has spanned three presidents and included the indictment of sitting Puerto Rico Gov. Aníbal Acevedo Vilá on campaign finance and tax charges in 2008. He was acquitted on all charges at trial despite testimony from several co-defendants who pleaded guilty and cooperated with prosecutors. Typically, the president nominates and the Senate confirms the 93 U.S. attorneys as the top prosecutors in each U.S. judicial district. Rodríguez-Vélez was appointed U.S. attorney by the Justice Department in June 2006 and nominated by President George W. Bush in January 2007. 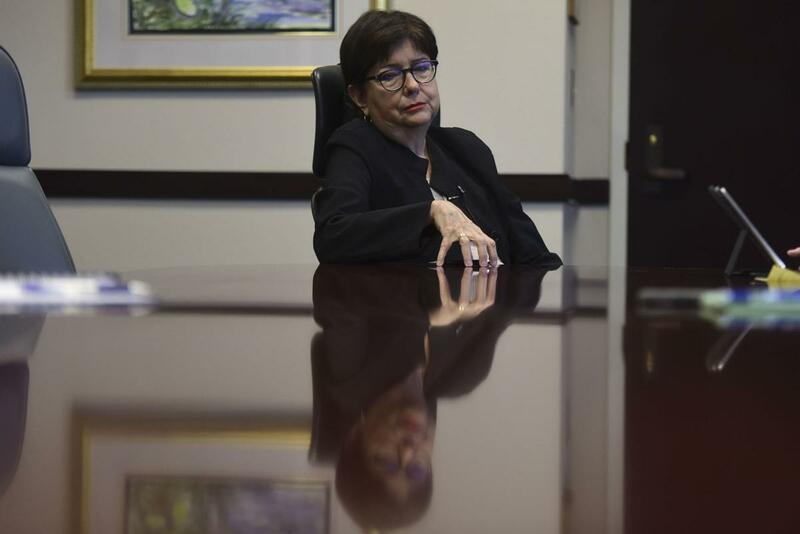 Although she was never confirmed by the Senate, Puerto Rico’s federal district court judges reappointed her to three successive four-year terms, most recently in 2015. In response to the Justice Department’s vetting of potential replacements, Ms. Rodríguez-Vélez has lobbied federal officials to argue she should stay, citing sensitive investigations her office is handling, according to a person familiar with the matter. She is slated to testify in a former subordinate’s discrimination and retaliation trial against her office that began on Monday, according to court documents. The plaintiff, former intelligence specialist Francisco Reyes Caparrós, filed a lawsuit in 2015 alleging that Rodríguez-Vélez and others stripped him of his normal job duties after he complained about having to run personal errands for his superiors. Her office has denied wrongdoing and said the plaintiff resigned after several internal reprimands.